Your commute on Metro buses may have just gotten a little noisier. The audio-only ads can even be geotargeted, meaning the recording can trigger when the bus passes a certain store or business. 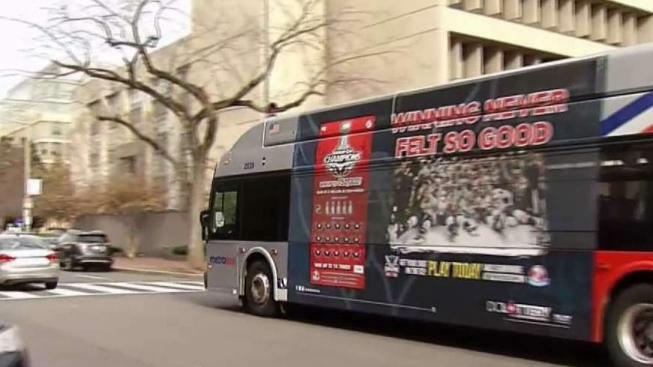 Promotions are already being played on routes including the 31, which runs through Georgetown and Foggy Bottom. This week, riders may hear a Megabus spot telling riders, "Don't miss mom's home cooking this holiday season." Over a 45-minute trip, a rider would hear about 90 to 120 seconds of advertisements, the company running the ads says. Some riders told News4 it seems annoying, but others say they always wear headphones anyway. "I already get annoyed," a rider told News4. "I think it's kind of weird considering it's like a public good," one rider said. "As long as it delivers value to us as riders. If not, I'm not going to pay that much attention," another rider said. Regardless, Metro is cashing in on the new promotions. The first contract is worth at least $250,000 a year. Not every route is using the ads yet. But if they're successful, Metro will look at expanding the program to more buses and even trains.